I originally found this recipe in COOK'S ILLUSTRATED and changed it very little. I served it with rice here for a change, but really prefer it served with mashed potatoes or buttered noodles since it makes such a nice gravy. Fry bacon over medium heat, stirring frequntly for 8-10 minutes until browned. Remove with slotted spoon to a paper towel and allow to drain. Reduce heat and add oil to make 2 tablespoons total in pan. Whisk in flour and cook until golden like the color of peanut butter. Slowly add broth and increase heat, whisking continuously until you reach a slow boil. Cover and set aside. In a large skillet bring 1 tablespoon of the avocado oil to high heat. Add pork chops and brown 2-3 minutes each side. Transfer chops to a plate. Add remaining oil to skillet and bring to heat. Add onions and water to skillet browning until just beginning to caramelize. Be sure to scrape up any browned bits from the skillet. Add thyme and garlic cooking until fragrant. 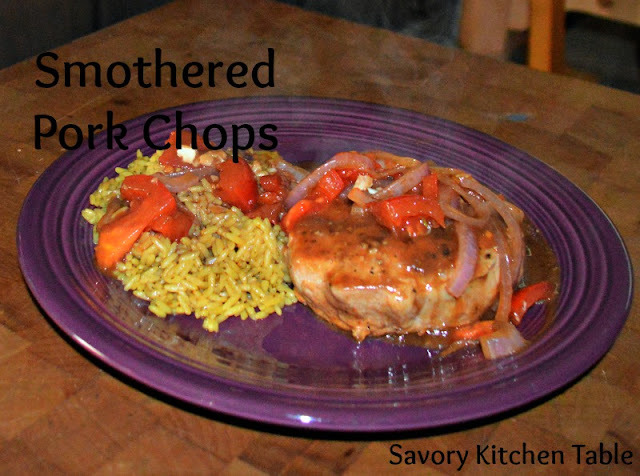 Add pork chops back into pan and pour sauce from other pan over top. Simmer 20-30 minutes until pork is tender and cooked through. Remove chops to a warming platter. Stir in parsley and season sauce with salt and pepper. Continue cooking until it reaches a gravy like consistency. Spoon over pork chops and top with reserved bacon.